Explore the Irish countryside in a colorful gypsy caravan. This old-fashioned mode of travel shows you sights others might miss. Park overnight near farms where the horse can graze in the fields. Travel picture of A horse-drawn caravan. Is it possible to get some information about time tables and prices, and how to make a reservation? We are interested in a holiday in the south of Ireland and go on a travel by horse drawn caravan. We would be interested in a week in June and have an extra horse. could I get additional information regarding the tour(origination and destinations), accomodations, number of people per caravan (I have 3 children) and prices. thank you and if possible any customer references would be great. Is it possible to get some information about time tables and prices, and how to make a reservation? We are interested in a 3/4 days trip on a travel by horse drawn caravan for beginning of July. Could you please send information about time tables and prices, and how to make a reservation? We are interested in a 3/4 day trip on a travel by horse drawn caravan beginning late June. We had a brilliant ten day holiday with yourselves back in 1992 and would love to try it again. I have many photos of the caravans enroute if you are interested for a website etc? Could you please send me booking information, prices and details etc..for perhaps a week/ ten days next summer?? can you send me info and prices for one week in july,two adults,one child(6 years).Hose drawn gypsy caravan,thank you. Slattery’s is no longer renting out the caravans unfortunatly. They had problems getting insurance and quit altogether a few years ago. 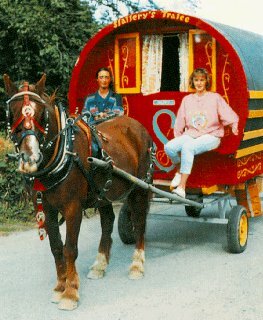 For anyone wanting to rent a horse drawn caravan in Ireland, they still do it in Wicklow and Mayo and in Laois (check Google). We rented one in Tralee in 2004 and ended up moving to the Dingle peninsula :) Lovely way to spend your holiday! great articles….. I have searched same articles since long time. The Khimsar Fort Palace hotel located in the Khimsar village is one of the popular palace hotels,located near Jodhpur, Rajasthan, North India. The best thing about khimsar (khimsar fort and khimsar sand dune village) and really important is that it is situated far from the city, so if you are with your family and want to spend quality time in isolation, then khimsar fort would prove to be an ideal destiny to plan holiday. In August 1975 we went for a horse caravan holiday in Ireland for the first time. In 1989 again. With Slattery. We took our time and stayed on for 31 days. We all have good memories of Ireland and of driving a horse caravan, riding horses taking our time! Now greetings to the Slattery people from us all! You too contributed to keep us healthy, normal and happy (the Irish way). Hi,can you please send us information and prices for your horse-drawn gypsy caravan offer? We are mother plus two kids, 12 and 13 and would love to do a 3 day-trip in the time-frame from 01-Aug2011 – 10-Aug-2011. I am looking forward to your reply! can we have more informations about the possibility to rent a gypsy caravan and a gentle horse for this year in August ? I’m very intrested in travelling to ireland in september this year and I’d like to explore the country with a horse-drawn caravan. Would you please send me further information about the prices and facilities of your buisness? Hello, can i please get prices and availability and details for 4 days of horse drawn carraige travel. Many thanks. Hi do you do 3 day hire of horse drawn caravans? On a trip from Australia, time is limited.